Kent and I recently hit the one month of marriage milestone, and I'm still finding it hard to believe that the day already came and went. Because we were surrounded by our favorite people who came from every corner of the U.S., it was a day that produced a joy that I've never known. We were supported by an incredible team of vendors, all of whom are friends. While we may share more of a look at our day down the road, I wanted to share a few sneak peeks to say thank you to the many hands who came together to design and execute our day. 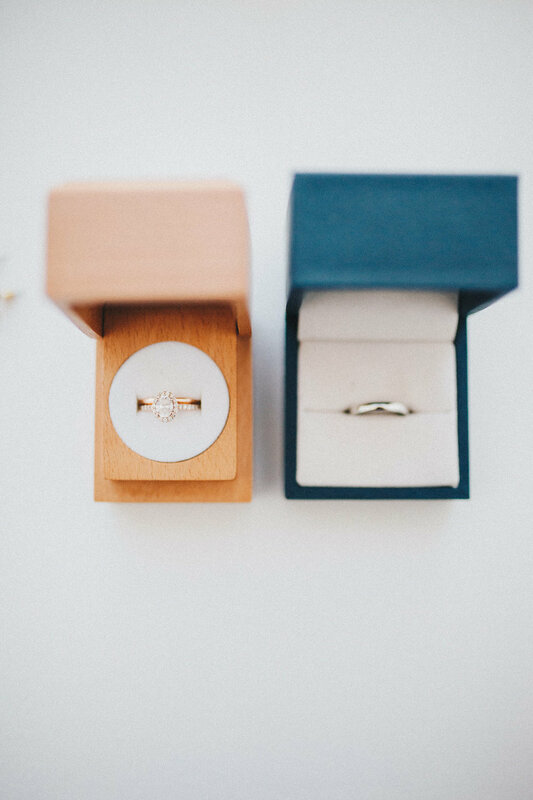 Though I've listed all of our vendors and professionals at the bottom of this post, we are also indebted to our family members, close friends and bridal party who helped with set up, tear down, and everything in between. 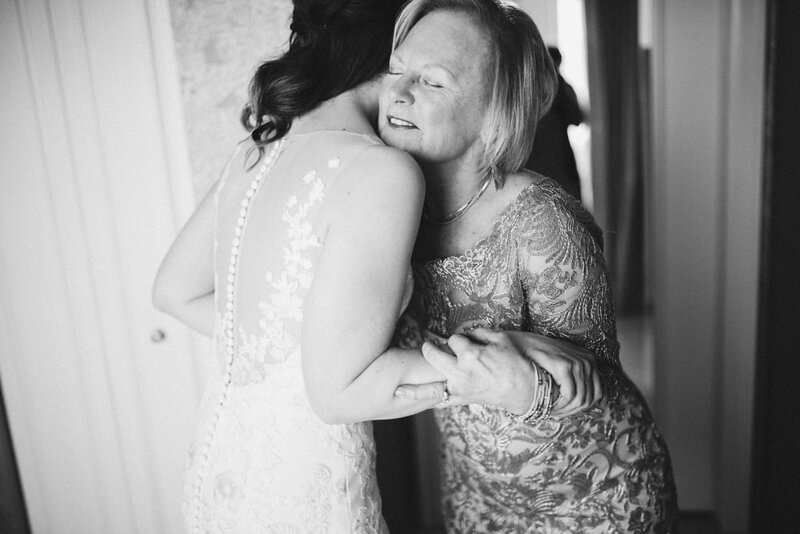 We adore the images that Monica Johnson captured of our day. If you scroll to the bottom of this post, you'll see our wedding video that Molly Thrasher blessed us with. We are beyond grateful. Monica and I have worked together on dozens of photo shoots at this point, so it was surreal to arrange our paper goods suite with my champion sister on the floor of our hotel room! 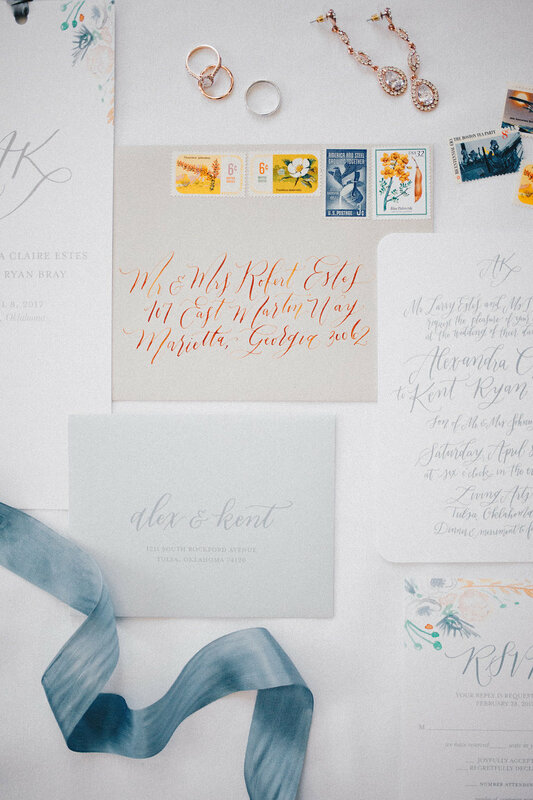 Our paper goods featured dusty blue calligraphy, watercolor florals, a blush silk ribbon tie, and a gold wax seal. I was particularly smitten with the ochre ink for a little something different. While all the girls got ready at the Ambassador Hotel, Kent and his groomsmen got ready at the house that we now call home together. 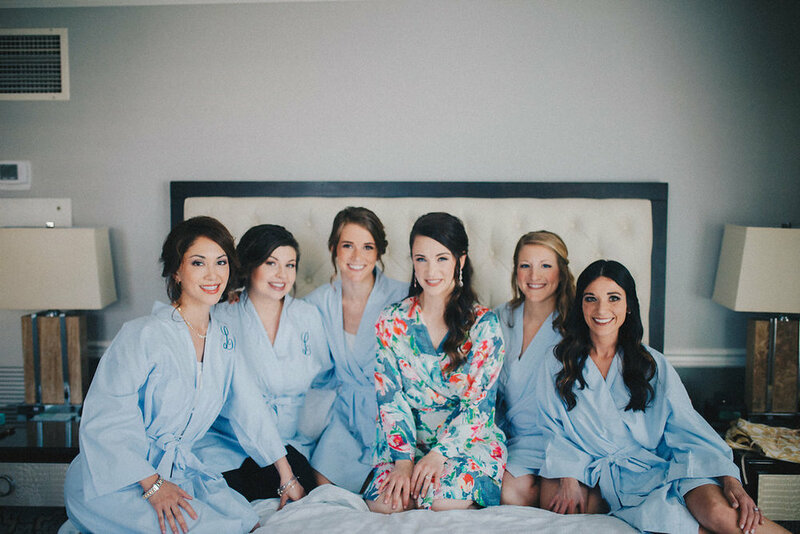 I wanted the morning of our wedding to be relaxing and special for our bridal party. The girls toasted with mimosas, snacks, and robes--and my favorite part was my dad's delivery of a Chic-fil-a nugget tray. :) We were in such good hands with Chelsey Ann Artistry, Atherial Beauty, and Candice Stubblefield for hair and makeup. It was so fun to have Katie and Taylor of Ever Something personally deliver our florals. It lifted my spirits to get to see them the morning of our wedding. We have worked together on so many projects over 3+ years and we love what they created for us. My mom hustled so hard the day of our wedding. 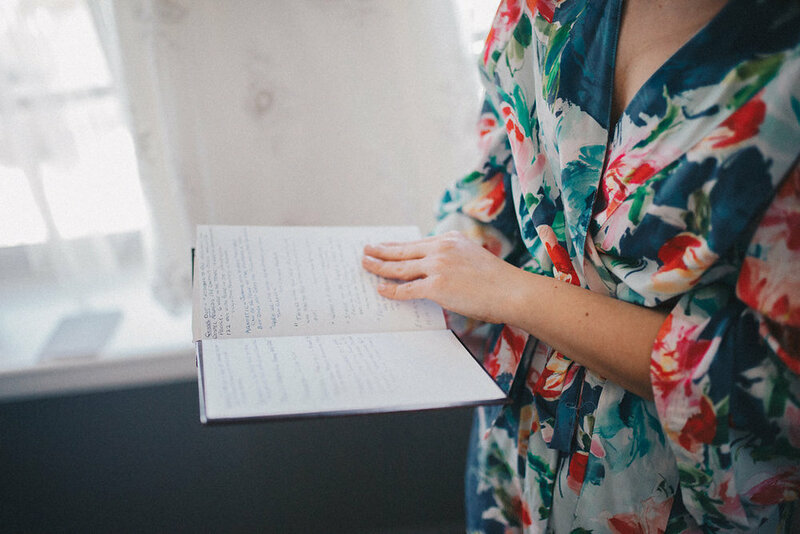 She joined forces with our two day-of coordinators, Molly and Cortney, and set up the wedding from the early morning. I was relieved to see her in the hotel suite before we left for our first look and she seemed so genuinely happy for us. She and my dad made it just in time to help me get in my dress! Actually, it took three people to get in my dress. A lot of buttons! My bridesmaids traveled from Seattle, San Francisco, Houston, and New York City to stand with me. I have been friends with all of them for 10+ years, so it meant the world to have them in Tulsa. All of my grandparents have passed away, but my aunt surprised me at our rehearsal dinner with my grandfather's taped-up Bible. He was a Sunday School teacher for many years, but he passed away before I became a Christian. I didn't cry a ton on our wedding day (I was so wired! ), but getting to see his Bible study notes and the quotes that he jotted down brought me to tears. It felt like a comfort to see his perfect block handwriting and helped me feel his presence. 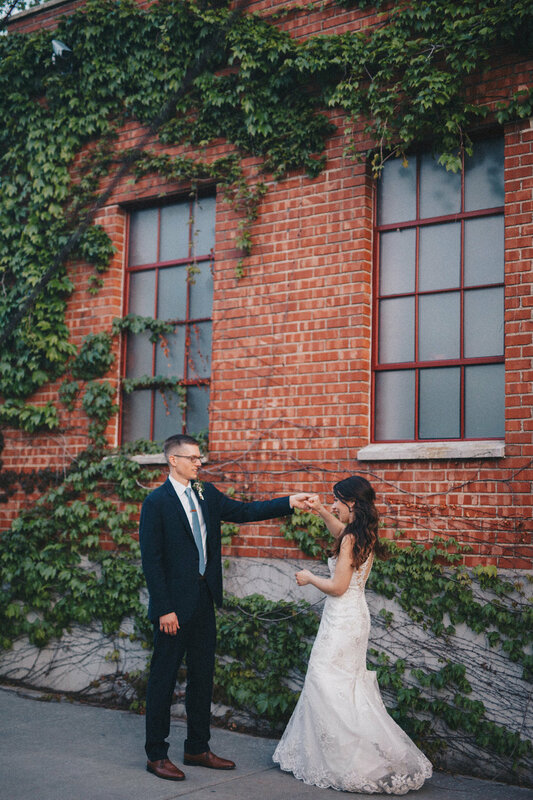 Kent and I opted to do a first look before the ceremony, and I'm so glad we did! 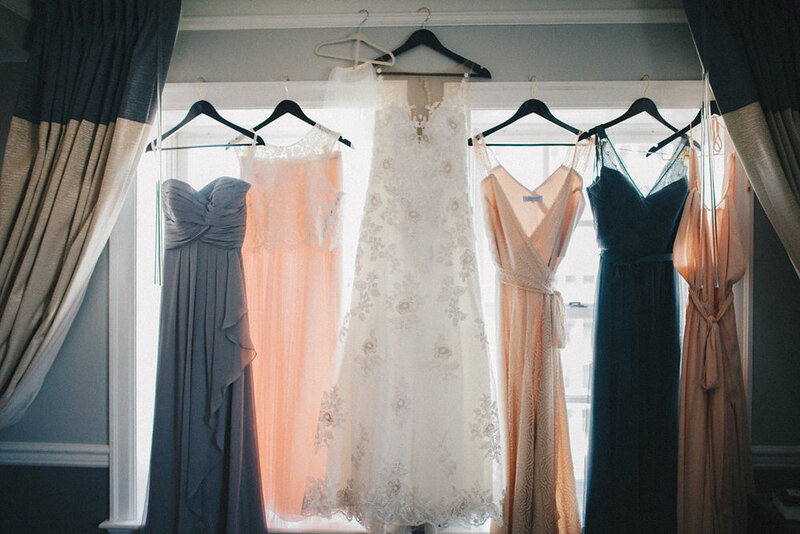 Everyone said that it would put us at ease to see each other before walking down the aisle. I'm glad we had more time together after spending the first half of the day apart. Kent and his groomsmen! They worked so hard to help set up our wedding, and we appreciate them so much. Our families! We love them! Our seating cards were tiny envelopes with numbers inside. My bridesmaids Marina and Chelsey saved the day by stuffing and alphabetizing all the tiny envelopes the day before the wedding. Brittany Viklund created an illustration for us that sad beside the display with milk glass vases (my favorite!). Our dessert table was a mix of homemade desserts made by our friends Maria, Kaiti, and Georgia, and Kent's Granny. We had Oklahoma cookies made by R and B Custom Cookies and the incredible Kayla of Round House Bakery treated us with a gorgeous cake for cutting--a gluten free Italian creme cake with strawberry filling. It was so delicious. The dessert was gone so quickly...note to brides: order way more than you need! One of my favorite parts of the day was getting to sneak out of the reception after dinner and take pictures and shoot video with Kent at sunset. Molly and Monica were so good to us on this day and these moments with just the four of us felt so natural. While the ceremony was important to us, we also wanted to make sure that our guests had fun at our wedding. These ladies made the dance floor so lively. We really did love our DJ, John. He did a wonderful job. We couldn't believe how quickly the reception went by! Below, you'll find the video that Molly Thrasher created for us. It truly captures the joy that we felt all day and we are forever grateful to her and Monica for capturing our personalities and our love so effortlessly.